For billions of years, dark energy couldn’t have been detected. Now, it’s everywhere we look. When we look out at the ultra-distant Universe, billion of light-years away, we’re seeing it as it was in the distant past as well. At those earlier times, the Universe was hotter, denser, and filled with smaller, younger, less-evolved galaxies. The light we see from way back in our Universe’s history only arrives at our eyes after journeying across these vast cosmic distances, where it’s stretched by the expanding fabric of space. It’s these early signals, and how that light gets stretched to longer wavelengths — i.e., redshifted — as a function of distance, that enable us to infer how the Universe expanded throughout its history. That’s how we discovered that the Universe wasn’t just expanding, but accelerating. That’s how we discovered dark energy and measured its properties. Our picture of the Universe will never be the same. Here’s what it was like when dark energy first took over. If you were somehow alive at the instant of the Big Bang, and could keep track of two different locations — one of which would correspond to where the Milky Way is today and another which would correspond to a distant, disconnected galaxy — what would you see? The answer would change over time. When the light first arrived, you’d see the Universe as it was at an age of 380,000 years old: when the Cosmic Microwave Background radiation first reached you. As time went on, you’d see molecular clouds form and contract, followed by stars forming in a slew of early nebulae, followed by the merger of star clusters to form proto-galaxies. 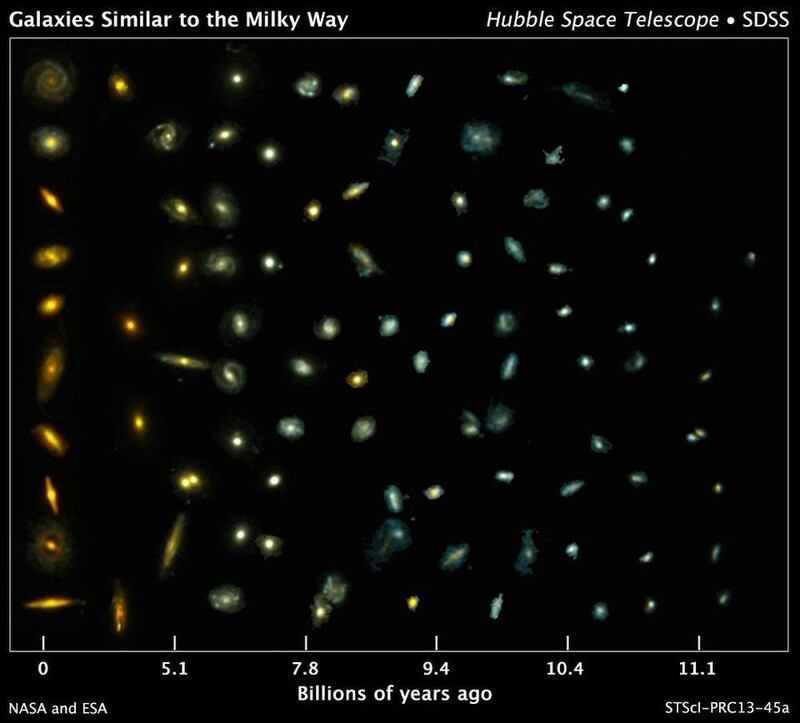 As time went on, you’d see these proto-galaxies merge, gravitate, and grow. Eventually, they would evolve into the galaxies we’re more familiar with, as they went through quiet eras punctuated by bursts of star-formation. One of the things we don’t typically talk about, however, is what we would see as far as redshift is concerned. One of the great properties of the Universe is that the laws of physics appear to be immutable and unchanging throughout time. This means that atoms absorb and emit light at very specific frequencies: frequencies that are the same everywhere, and determined by the energy levels that the electrons within the atom occupy. By identifying series of atomic absorption or emission lines that correspond to the same element at the same redshift, we can pinpoint an object’s observed redshift. By determining its distance from us, we can use the distance/redshift combination to reconstruct the history of the expanding Universe. In reality, we can only make observations at one point in time: today, or when the light from all the distant objects throughout the Universe is finally reaching us. But we can imagine our hypothetical scenario just as well. What would we see if we could track a single, individual galaxy — including both its distance and its redshift as seen from our perspective — throughout the history of the Universe? The answer may be a little counterintuitive, but it’s tremendously illustrative and educational as far as shedding light on not only what dark energy is, but how it affects the expansion of the Universe. In the earliest stages, the light that first arrived would give you a combination of two parameters: a distance that was relatively small compared to the distances we see today, and a redshift that was large compared to what we see today. The redshift corresponds to an apparent recession speed, or how quickly the object in question appears to be moving away from us. In reality, it isn’t that the object’s motion is causing the redshift, although motion towards (blueshift) or away from (redshift) an observer can certainly cause that effect. Instead, it’s the fact that the light is traveling through the fabric of space — and that the fabric expands while the light travels — that causes what appears to be a redshift. Initially, the distances would be small and the redshifts would be large: we would infer that this distant galaxy is speeding away from us at a very rapid rate. But then time runs forward, and both distance and velocity appear to change in opposite directions. 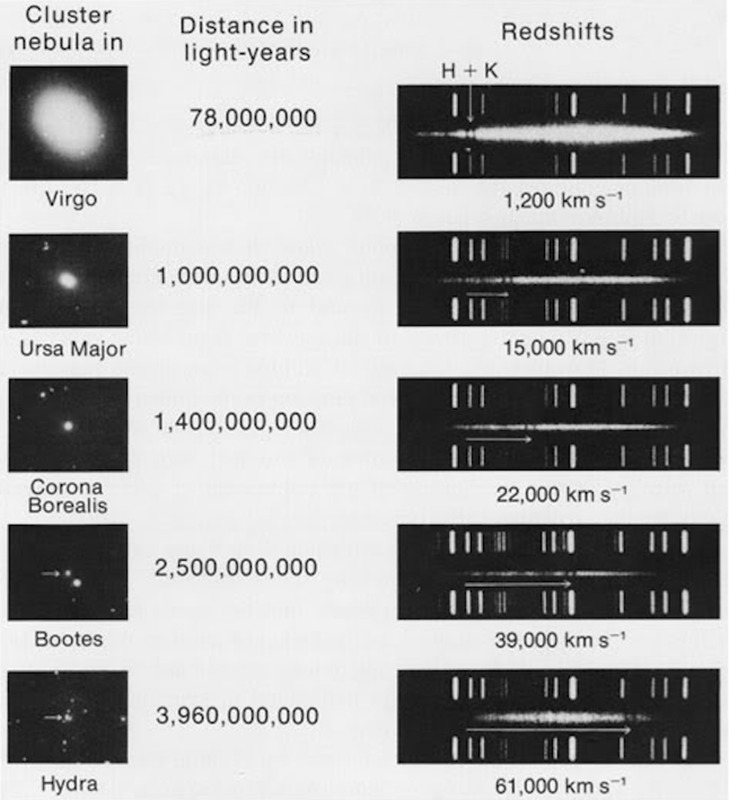 The distances get larger and larger over time, as the Universe continues to expand. This pushes all objects that aren’t gravitationally bound mutually away from one another, increasing the measured distance between them. 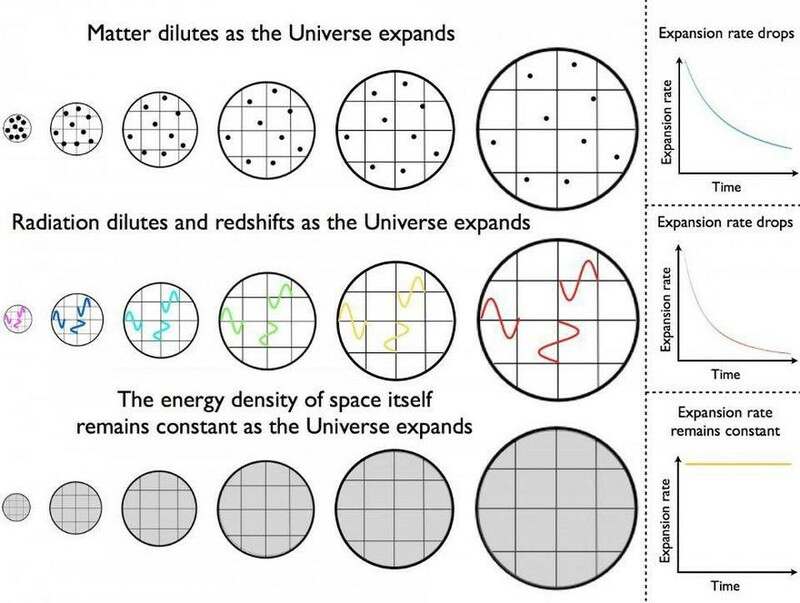 The Universe’s expansion rate changes, and it changes dependent on the total matter and energy density present in the Universe. Since an increasing volume means a decreasing energy density, the expansion rate drops, and the galaxy appears to move away from us at a slower and slower speed. 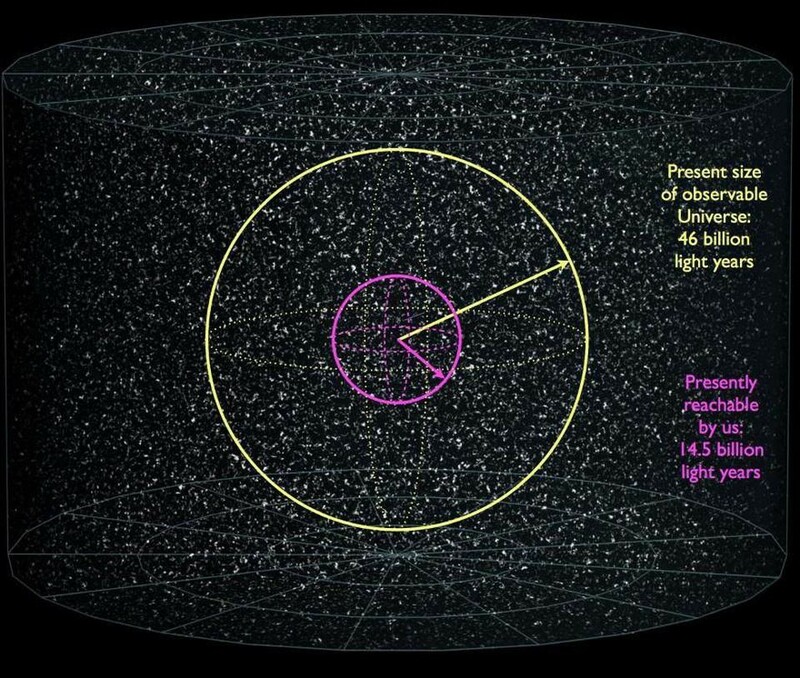 This makes sense when you think about the expanding Universe in the context of the Big Bang. There is a great cosmic race going on: between gravity, working to pull everything back together, and the initial expansion rate, working to drive everything apart. 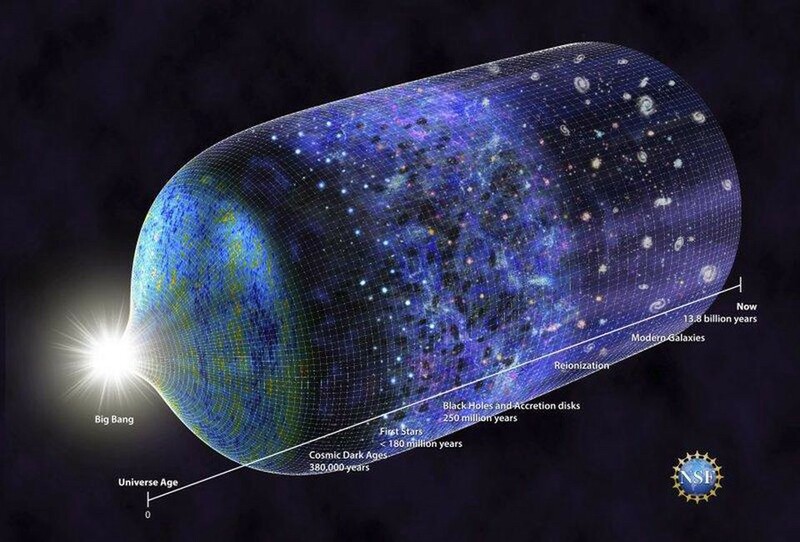 The race has been underway for 13.8 billion years, and the Big Bang was the starting gun. Everything begins moving away from everything else, extremely rapidly at first, while gravity works as hard as it can to pull everything back together. If there were too much matter in the Universe, everything would expand only until a point, as the Universe reached a maximum size and then the expansion reversed. Eventually, the Universe would recollapse. On the other hand, if there were too little matter, the expansion would continue forever, with the expansion rate decreasing and the apparent recession velocities asymptoting to zero. This latter case is exactly what we’d see happening for a long time: for billions of years, in the case of our Universe. An individual galaxy appears to move away from us at an incredibly fast rate, but then its recession velocity drops as the matter and radiation densities drop. Since it’s the total energy density that determines the expansion rate, and the expansion rate that determines what we infer the recession velocity to be, this all makes intuitive sense. And then, 7.8 billion years after the Big Bang, things start to get weird. As it turns out, the Universe isn’t just filled with matter and radiation. Even adding in neutrinos, black holes, dark matter and more doesn’t account for everything. In addition to all of those, we have dark energy: a form of energy inherent to space itself. 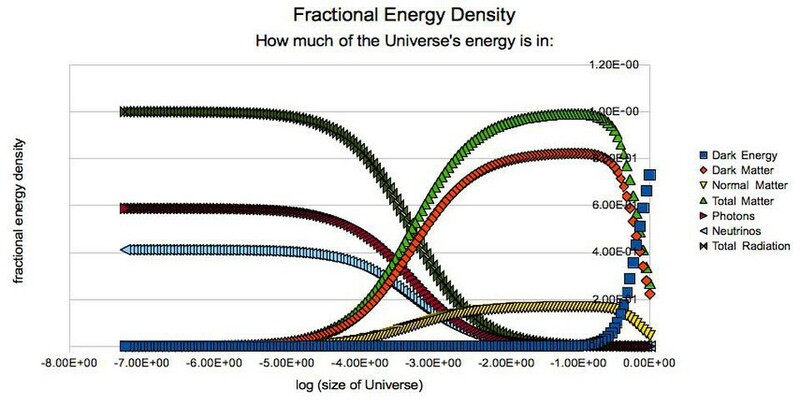 As the Universe expands, dark energy doesn’t dilute; it remains at a constant density. 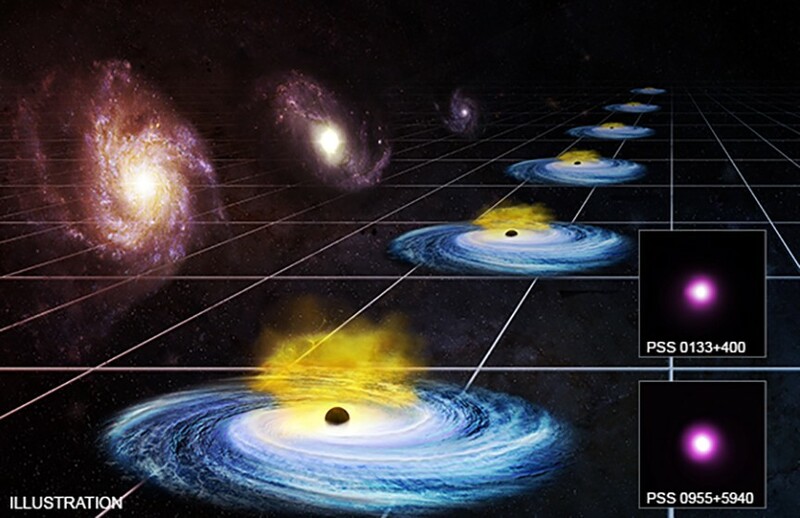 After 7.8 billion years, the matter density drops far enough that the effects of dark energy begin to become important. 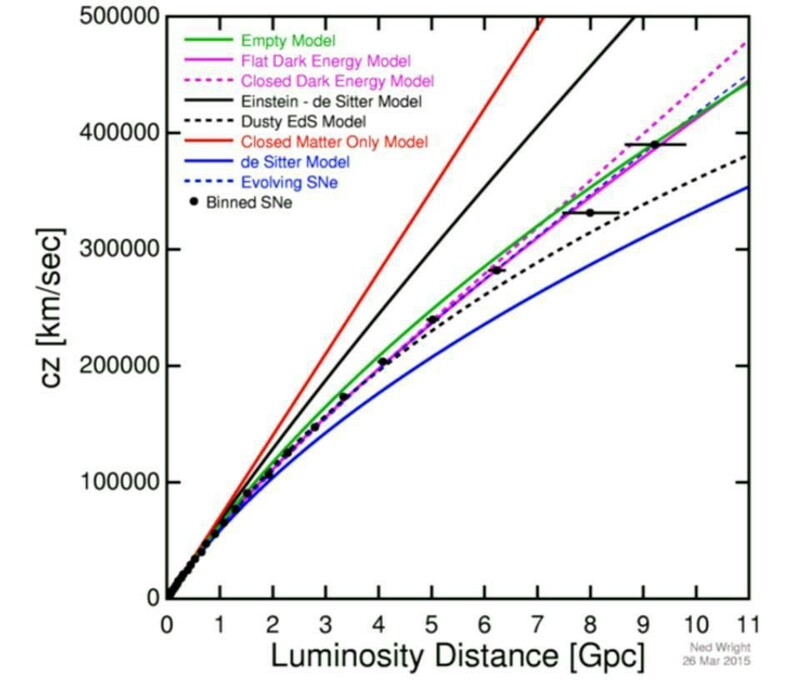 7.8 billion years after the Big Bang, the dark energy density will have grown to be as large as half the matter density, which is the critical value it needs to reach in order to cause a distant galaxy to stop decelerating from our perspective. At this moment in cosmic history, 7.8 billion years after the Big Bang, every distant object in the Universe will appear to coast away from us: it will continue to speed away at whatever speed it was moving previously. It will neither accelerate nor decelerate, but maintain a constant apparent motion in its recession. This is a critical time: the repulsive effects of dark energy on the Universe’s expansion exactly counteract the attractive effects of matter. But time doesn’t stop here. Instead, it continues forward, and the matter density continues to drop. Once 7.8 billion years on the cosmic clock ticks by, dark energy now becomes more important than matter and radiation as far as the expansion rate is concerned. Distant galaxies may have reached their minimum recession speed at that time, but then will appear to speed up once again. As time marches forward, distant objects not bound to one another will recede from each other’s perspective at a faster and faster rate. By the time the Universe is 9.2 billion years old, right when our Solar System is forming, the matter density will have dropped below the dark energy density. By the present day, 13.8 billion years after the Big Bang, dark energy accounts for approximately 70% of the total energy in the Universe. Throughout all that time, distant galaxies will continue to speed up, faster and faster, in their apparent recession from our perspective. For the past 6 billion years, the Universe’s expansion has been accelerating, meaning that any distant galaxy we monitor appears to recede from us at an ever-increasing speed. Once a galaxy reaches a distance of approximately 15 to 16 billion light-years from us, it will appear to recede away faster than the speed of light, meaning there’s nothing we can ever do to reach or contact it again. 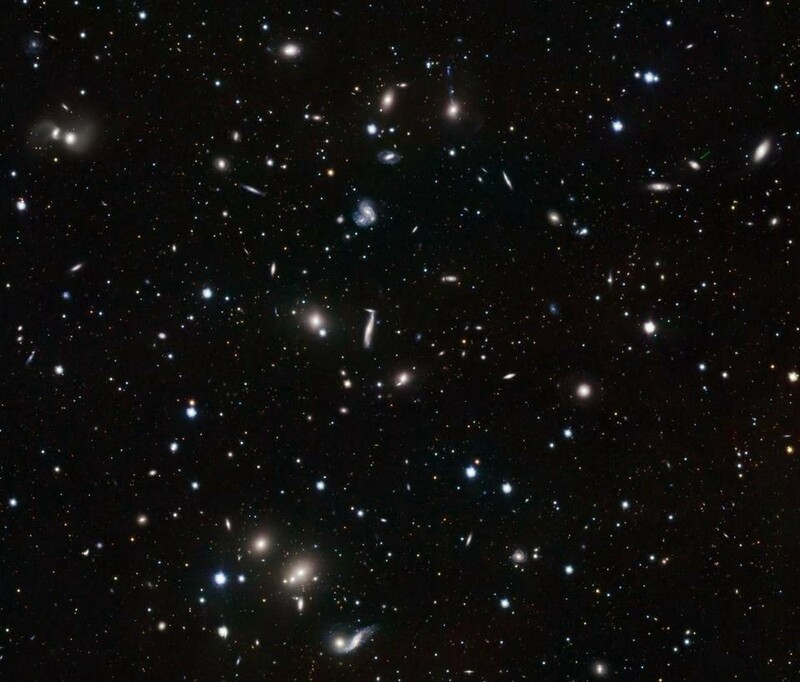 Given that the Universe is already 46 billion light-years in radius, this means that 97% of the galaxies in the Universe are already forever beyond our reach. For billions of years, dark energy’s density would have been tiny compared to the density of matter, meaning its effects would have been undetectable if we had come along too early. Tens of billions of years from now, it will have pushed everything beyond our Local Group far away from us; the merged remains of the Local Group will be the only galaxy left. It’s only because we came along when we did, at this golden cosmic time, that we can perceive what the Universe is actually made of. Dark energy is real, has dominated our Universe since it was 7.8 billion years old, and will determine the fate of our Universe from here on out. What was it like when starlight first broke through the Universe’s neutral atoms? What was it like when the Universe made its heaviest elements?